Now, that would be out of this world! How about an "Attacky Packages" coloring book? Either a Wacky or Attacky Packages coloring book would be cool! 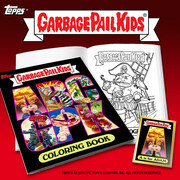 I noticed the GPK book comes with a card, but that there are 3 color variations. I wonder if they'll sort them so people who order 3 books get all the card variations? I imagine that there are a lot of GPK fans wondering the same thing right now! Attacky Packages...I like how you think! @koduck. Looks like the colouring book was a success. Already sold out. Glad I ordered yesterday! hehehehe...we are not short on superlatives today. It's WORSE than before? How is that possible? As with other websites that have been redesigned, probably someone, somewhere is trying to justify their importance and/or salary. It actually took me a few minutes to find Wacky Packages, however once found, you'll see that they're just a couple of clicks away. Different maze for us ratz to navigate, that's all. I think this looks like a very cool and fun item. I wish Topps would do this for Wackys! Dave Gross (or anyone with any inside info) know why GPK collectors get all the love and we get so little? I would imagine it's simple economics that there are more of them than there are of us. But if Topps offered some quality Wacky items at a fair price, I can't imagine they wouldn't sell well enough. I noticed the GPK book comes with a card, but that there are 3 color variations. I wonder if they'll sort them so people who order 3 books get all the card variations? I imagine that there are a lot of GPK fans wondering the same thing right now! Ya gotta love Topps for their greediness again. Lets make something that no one would want more than one of (unless you intend to sell them on ebay later or really want to color in one and have one to keep), but lets add something less valuable to it, make three different variations of it, and make them want to buy three. This is starting to sound like women's perfume with the free gifts that entice them to buy more. As a web application developer who has no artistic talent (they took away my crayons in the 2nd grade), I loathe web site redesigns that look "oh so pretty" but become almost impossible to navigate. Who is giving these people advice? I guess "they just have to look good, they don't have to be clear." On another note, I do love their new section on Guide to Collecting -- especially with the checklists from every series. They also have a 10% on your first order offer if you sign up for the newsletter. yep, throwing in the variety of bonus cards is definitely just a way to move more stock. I recall a similar thing with one of the Wacky comics, with 3 different bonus cards, and if you bought 3 comics, you also received a 4th bonus. seems like the site is heavily geared towards their baseball offerings, to such an extent that non-sports are merely an afterthought. There used to be an entire Entertainment section, now Wacky's, GPK;s, etc. are randomly tucked away. One of the better options to find things might be to use the Search window. But even there, highly specific searches will turn up thousands of stupid hits for no apparent reason, with their default selection of 'Relevance'. Searching for "Wacky Packages 80th Anniversary Poster", won't find you the recent poster, but it will sure find you a lot of other stuff. I think this looks like a very cool and fun item. I wish Topps would do this for Wackys! No worries! I've already proposed the idea to them! Good to know, Neil! Thanks and keep those proposals coming! Do you have any sense from those at Topps why Wacky offerings are so few and far between? 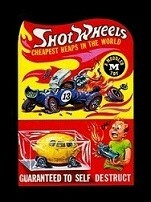 Particularly compared to GPK items? They should consider an accompanying box of Crakola Crayons!!!!!! Great suggestion since that's one of the titles that I've suggested for the book! Imagine if we could get them to include a real product parody, like the "kill kat" thing! Glad to hear it, Neil! I know you can't say anything, but it's nice to know we Wacky collectors haven't been totally forgotten. How rosier can it be?